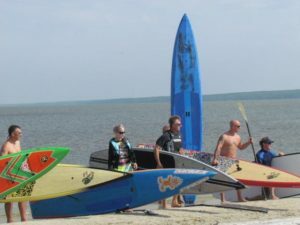 Join us for stand up paddleboard lessons all summer long! 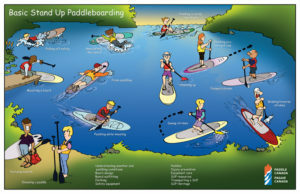 Learn from Manitoba’s most experienced SUP instructors. From beginners to advanced paddlers, we have a course option for you. Also included with every flatwater lesson is a one day SUP rental on any day of your choice, so you will have plenty of extra time to practice your new paddling skills! Learn to SUP with us this summer! Our 2.5 hour intro course teaches you the basic skills and knowledge to safely paddle in calm sheltered waters. Skills covered include mounting, kneeling, standing on a board, forward and turning strokes, safety awareness, carrying and loading boards, and more! Already learned the basics? Take the next step and build on your existing SUP skills. Our 2.5 hour advanced skills course teaches you skills and knowledge to safely paddle inland waterways with wind and waves. Skills covered include pivot turns, draw strokes, foot positions, upwind and downwind paddling, edging, bracing, and more! 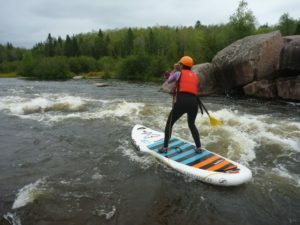 Learn the theory and skills for safely handling a stand up paddleboard in easy Class 1 rivers and surfing on river standing waves. The emphasis is on mastering the fundamentals of river paddling, along with a strong grounding in water safety and safe paddleboarding practices. Topics include: river hazards & safety awareness, eddy turns, ferries, river reading, river dynamics, efficient use of the river, and surfing standing waves. Private, custom, and corporate group events, lessons, outings, and team building activities are also available. Contact us to see how we can come up with something fun for your group!